Heather Laferriere received her Master of Science degree in Physical Therapy from the University of Connecticut in 2003. She has more than 10 years of experience working in outpatient rehabilitation and has attended over 30 continuing education courses. Heather became an Orthopedic Certified Specialist (OCS) in 2008 and completed her Doctorate in Physical Therapy at Regis University in 2013. This program focuses on evidence-based manual therapy and is taught by many of the experts in the field of physical therapy. Heather holds many certifications in different treatment approaches, as she realizes that everyone requires an individualized approach to care. She is certified in Functional Dry Needling through KinetaCore and uses this technique on conjunction with movement re-education to decrease pain and restore faulty movement patterns. She received her certification in Selective Functional Movement in 2015. This is a method used to assist in determining the root cause of pain by assessment of mobility and stability of the whole body. Heather has a special interest in treating the spine and she is certified in the Schroth Scoliosis Rehabilitation Method through the Barcelona Scoliosis Physical Therapy School. She is also certified in NeuroKinetic Therapy®, which is a means of identifying compensation patterns that may be contributing to pain and movement pattern dysfunction. Heather’s treatment approach utilizes a combination of hands-on techniques with corrective exercise and is heavy on patient education. Her treatment is based on a whole body assessment to determine the source(s) of dysfunction, rather than chasing the pain. She incorporates gait and functional movement assessment in order to specifically direct movement re-training. She strives to empower every patient so that they are able to accomplish their goals, prevent future problems and return to active living. 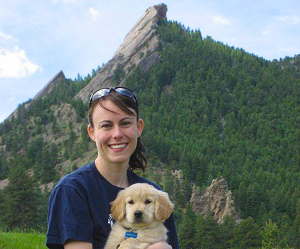 Heather and her husband, Brian moved to Colorado in 2008 to enjoy hiking, camping and skiing in the beautiful mountains. Heather also spends her time cooking, practicing yoga, trail running and walking her dog, Maple.